GTFO provides an audible alert when you're standing in something you're not supposed to be standing in. In some cases, you'll be warned before you start taking damage. This mod improves your situational awareness and is recommended for dungeon divers and raiders of all skill levels as even the most seasoned veteran sometimes needs a reminder to GTFO. It's particularly useful for individuals that play with their spell graphics turned down as well as assisting with PvP when you can't tell who's casting the AOE. Important Announcement: As with any new expansion or content patch, there may be alerts that are untested as well as encounter changes from Beta/PTR. Bug reports are highly appreciated! Install and you're ready to go. 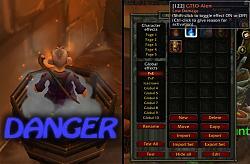 You can configure the mod by typing "/gtfo options" or by navigating to Options->Interface->AddOns->GTFO. To use the "Play sounds when muted" option and still hear GTFO sounds, your "Master Volume" and "Sound" sliders must be set to a value higher than 0%. 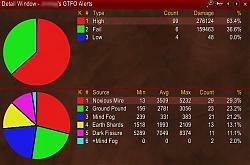 GTFO can be set up with Weak Auras to provide visual alerts in addition to (or in lieu of) the audible alerts. 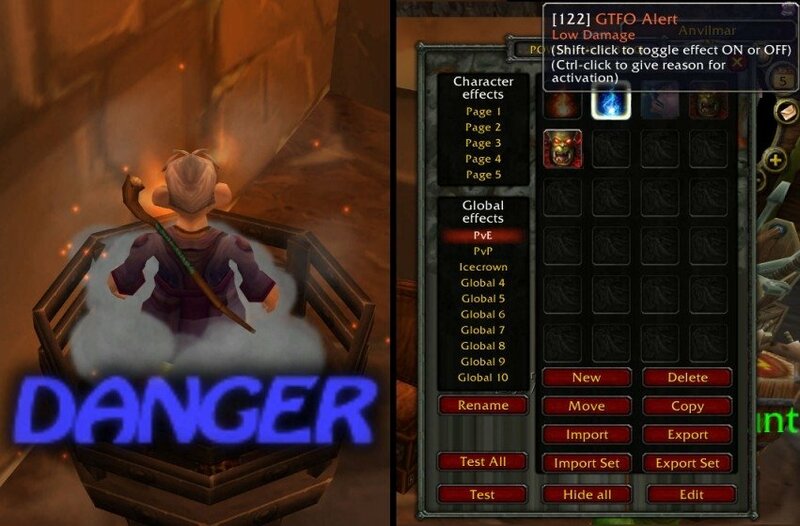 Click "Texture", "Text", or "Icon"
Change the "Type" to "Event"
Change the "Event" to "GTFO Alert"
GTFO can be set up with Power Auras to provide visual alerts in addition to (or in lieu of) the audible alerts. Change the dropdown value for "Activation By:" to "GTFO Alert"
GTFO can be set up with Recount or Skada to provide detailed statistical information of alerts. 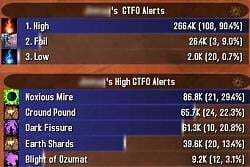 A word of caution: the damage amount displayed on GTFO Alerts may not be fully indicative of the total damage done, especially with fail alerts. For example: if you're hit by a tornado, the damage and fail alert from the tornado picking you up could be 5k, but the fall damage when you hit the ground afterwards is 100k. The amount recorded by Recount/Skada will be 5k. 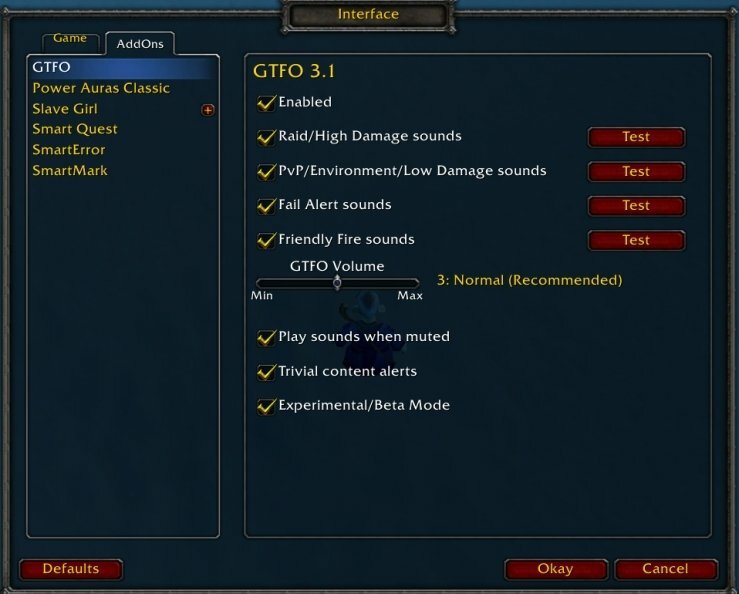 * Added "Fatigue" to "special alerts"
* Changed addon communications to use "GTFO" only instead of "GTFO_u" and "GTFO_v"
Wowinterface notified me there is a new version. It shows up in my favorites but the download link returns 'file not found'. Thanks for letting me know. I re-uploaded it so hopefully it will appear for download shortly. am i missing the donate tab here or am i just loosing it? Last edited by tonyis3l33t : 08-21-16 at 01:59 PM. 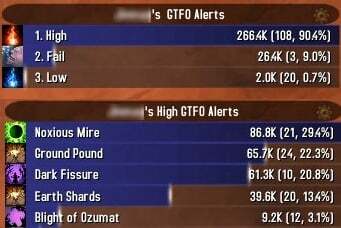 hi, is it possible to add gtfo alert to Tell Me when ? WeakAuras has been supported in GTFO for quite some time. Just choose a trigger type of "Event" and "GTFO Alert." Refer to the instructions on the addon's description page for setting up in WeakAuras. Hopefully Blizzard fixes it soon. The friendly fire sound for the Stormcloud debuff from Throne of Thunder trash (spellid: 139900) should only trigger if it hits players other than yourself. It's designed to do that, but it was incorrectly looking for a BUFF instead of a DEBUFF to suppress the alert. I'll post a fix.